Obtain fast, simple, and highly reproducible trypsin protein digestion for peptide characterization and quantitation in biopharmaceutical protein research. SMART Digest kits enable you to characterize and quantitate proteins faster, easier, and quicker than ever before. This version of the kit uses trypsin, which cleaves peptides on the C-terminal side of lysine and arginine amino acid residues. Typically it takes less than 60 minutes (dependent on sample complexity) to achieve full digestion, whereas an in-solution digest can take up to 24 hours. Reduction in the number of chemicals used and the immobilized trypsin design helps mitigate against chemically induced post translational modifications (PTMs) and autolysis. This results in results which are easier to interpret. 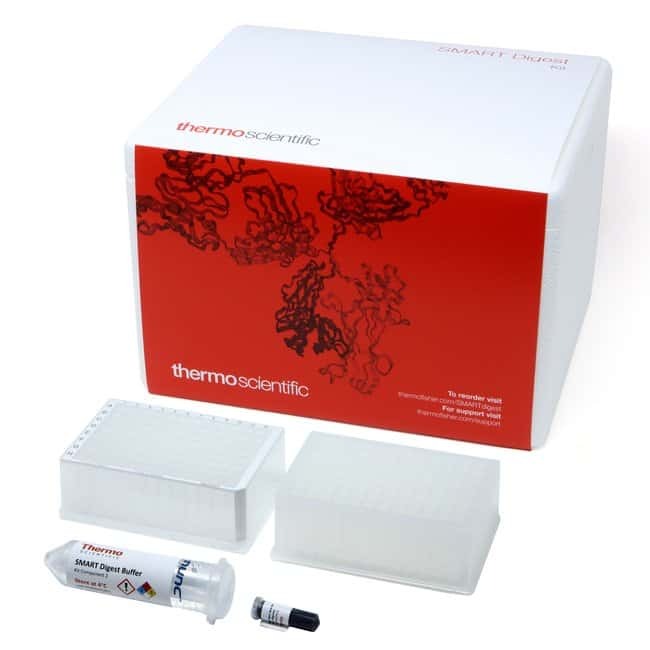 When used with the SMART Digest kits for desalting, Thermo Scientific™ SOLAµ™ SPE solid phase extraction plates provide a fast, easy-to-use, robust, and easily automatable sample preparation solution for analysis of biomolecules.